This is the third of four posts about the farm accounts from Blackhall that covered the first couple of years of Thomas Smith’s occupancy of the house and farm. 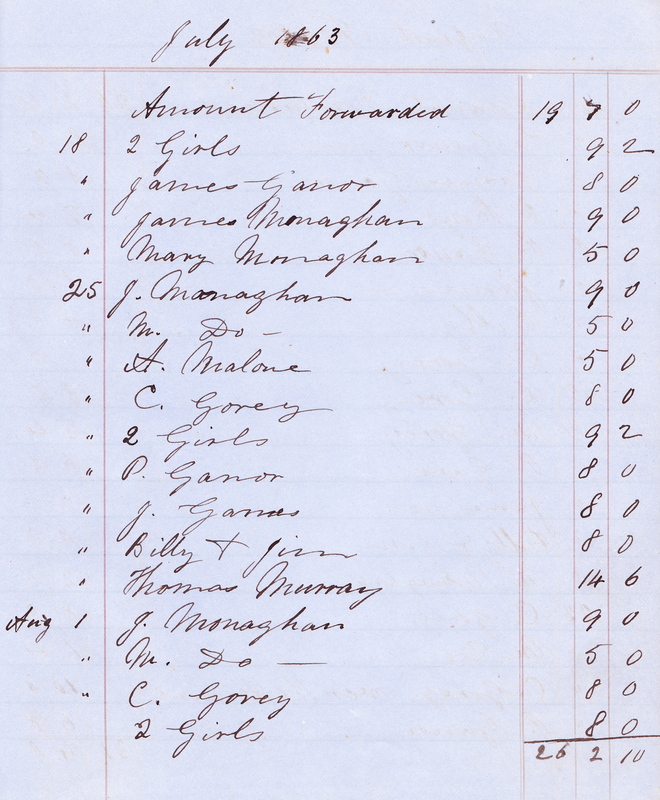 The costs for farm labourers in 1863 were written in a separate section in Thomas Smith’s accounts book. Labour costs included the weekly wages for the men working regularly on the farm as well as occasional wages for others, including a few boys and girls (unnamed) and some men to cut hay, do carpentry and so forth. 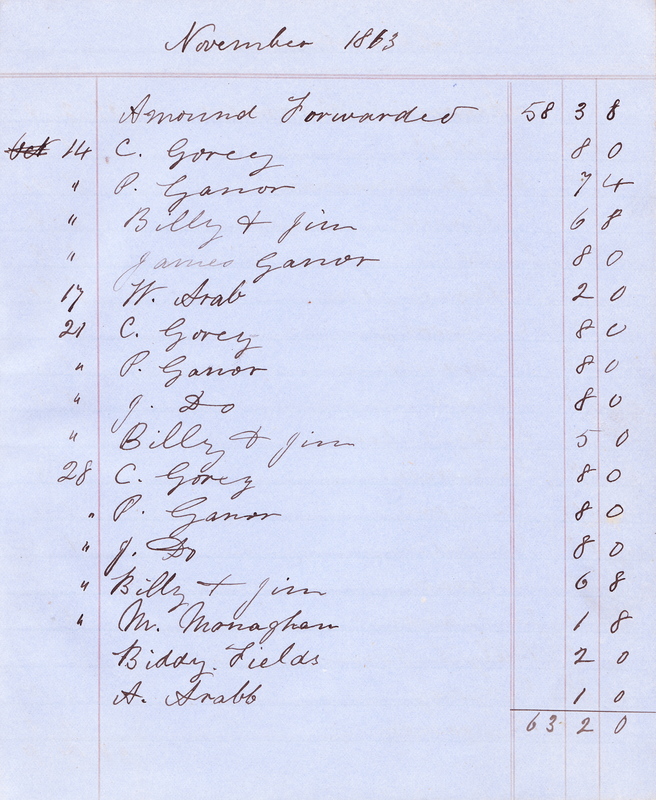 Starting on 11 April 1863 and going to the end of December, the labour costs were £76 15s 8d. There was no separate account for labour costs in 1864 but we could assume they were roughly the same per month for a total cost to Thomas Smith of about £100 for the year. The typical pay rate for one of the men regularly employed on the farm was 8 shillings a week, which seems pitifully small. This is where a different way of translating the value of the money needs to be used. To understand what would be the value of labour in the past I think it is best to use income value (or economic status) as a way of finding an equivalent in earning power. I have used the website measuring worth to identify the equivalent in income value today. For every £1 paid to a farm labourer in 1863, the income value has been calculated as being equal to about £771 today. Using that method of calculation, the total income value for the farm workers in 1863 was equal to £60,000 today. Similarly, a weekly wage of 8 shillings would be equal to about £300 now. That is still not a princely sum but it would be possible to live on it, especially in the country where people would be growing most of their own food. The children employed for half or less than half of the men’s wages would probably be working only part-time but they would be helping to increase their family’s income. 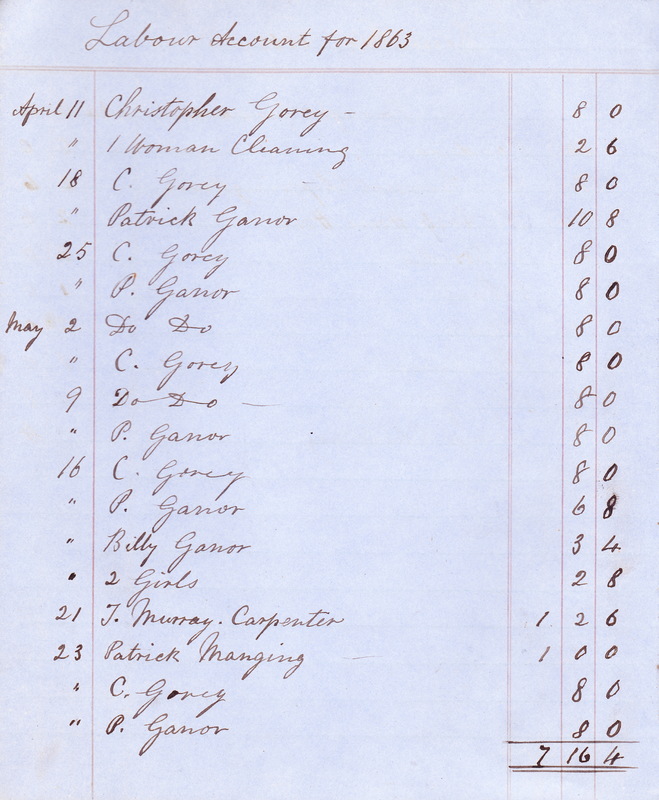 The names shown at the beginning of this section of the accounts recur over and over again throughout the year in 1863: Christopher Gorey, Patrick Ganor, Billy Ganor (who was paid half of what the other two got either because he was a boy or he worked only half-time on the farm). Later, there is mention of James Ganor, James Monaghan and Mary Monaghan, and Biddy Fields. There are also a few mentions of other names: W. Arab and A. Arabb, paid at very low rates. Possibly these were children of the man who hired out horses to Thomas. There were a couple of men with higher skill levels: T. Murray, carpenter, and Patrick Manging (no occupation given). Both these men were paid £1 or more each time they were employed. 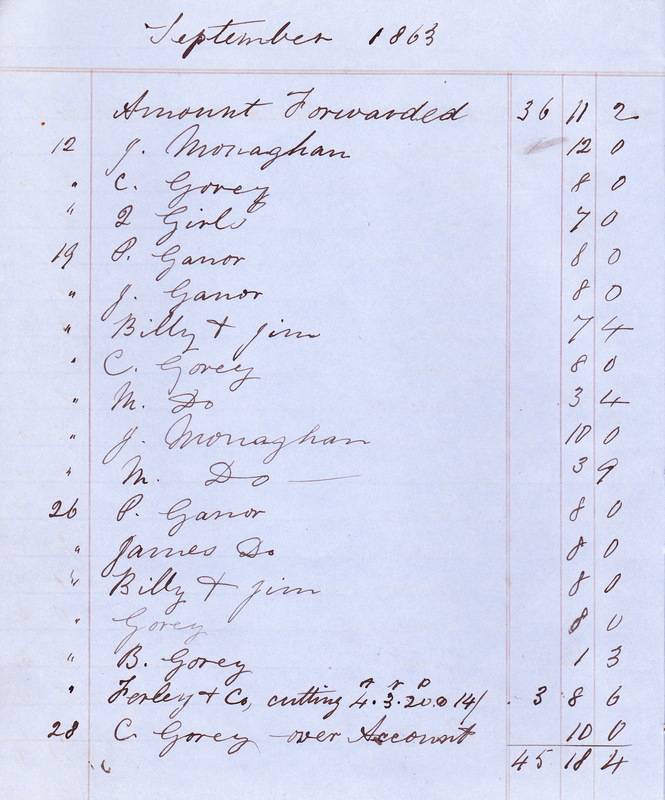 There was also one occasion where “Farley & Co” were employed to cut over 4 acres of hay at 14 shillings per acre. Sometimes “2 girls” or “2 boys” are listed without names and paid a lower rate than the regular men. As you might expect, more people were employed on the farm in summer than at the beginning of the year. July was a particularly busy month, as was September. Looking at the dates shown for the payment of the farm workers, they have a regular weekly pattern most of the time. The dates that are listed for paying the workers each week were Saturdays, according to the perpetual calendars I consulted.